We live on an entirely changed globe compared to humans who lived only 125 years ago. Our immune system now must try to negotiate what is “self” and “other” while being exposed to 80,000 synthetic chemicals, record amounts of toxic metals, genetically modified proteins in food, altered gut ecology and a change from mainly unprocessed, whole foods to highly processed, nutritionally deficient foods. Add to this numerous heretofore never experienced electromagnetic frequencies (e.g. cell phone energies, cell towers and other EMF’s) and one can start to understand why there are so many immunologic diseases. We, our individual immune systems, live in a world of confusion. Allergies were first reported in England in the middle of the 19th century in the upper classes who could afford to eat more and more processed food and never got their hands dirty. It is now thought that they lost the vast diversity of their intestinal microbiome and simultaneously experienced a loss of nutrient density of their increasingly processed diet. Hippocrates stated, “All disease beings in the gut.” We are learning this in detail in the first part of the 21st century, but we are also learning that most diseases have their origin in immune dysfunction. After allergies appeared on a large scale, about 150 years ago, the other side of the immune dysfunction coin followed – autoimmune processes. It is now claimed by the immunology profession that one in six or more people suffer from one or more of about 100 autoimmune diseases. It is thought by some of these scientists that for every case diagnosed there is probably another individual who goes undiagnosed. Each of us knows a number of individuals who suffer from one of these conditions – multiple sclerosis, rheumatoid arthritis, lupus, psoriasis, ulcerative colitis, blood disorders and many elusive diseases thought to have an immunological underpinning such as "Chronic Fatigue Syndrome or Fibromyalgia). Many chronically ill people never even get a diagnosis and are just given symptomatic therapy with drugs. People don’t know where to turn. They are confused and, their immune systems are confused. Dr. Yahuda Shoenfeld, a very famous Israeli immunologist has stated, “All chronic diseases have autoimmune components.” The immune system reacts against pollen, mold, bacteria, food proteins, chemicals – indeed almost anything that appears to be a threat to the “self”, the person, and produces various inflammatory substances, activates specialized white blood cells and commences a general attack to rid the body of an invader. In the case of a bacterial infection all these actions are appropriate of course. After the infection is under control, the inflammatory processes subside and the system returns to baseline. Imagine for a minute that, because of all the confusing stimuli new to the world coupled with a state of overall nutritional depletion and a dramatically altered intestinal microbiome, that the attack is never called off. The inflammation continues and the immune system begins to attack the body itself – its myelin nerve sheaths (multiple sclerosis), joints (rheumatoid arthritis), skin (psoriasis), specific neurons (schizophrenia, Parkinson’s Disease, ALS, depression). Yes, it is now thought that ALL chronic conditions, even osteoporosis have an autoimmune component, at least in part. 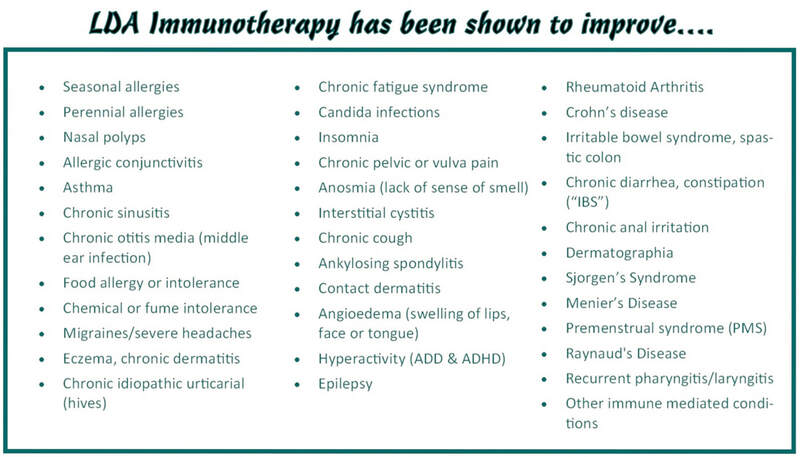 The present treatments for autoimmune disease are immune-suppressing drugs, anti-inflammatory agents and various monoclonal antibody therapies. While these can be effective, they all are potentially dangerous. They don’t get to the basis of the disease – the confusion. With this background we will now present a revolutionary approach to treating both allergies and autoimmune disease with a simple, safe, elegant method that helps retrain the immune system to cease overreacting to substances in the environment – pollen, mold, etc., as well as molecules in food that may be causing symptoms after they are eaten, and to dampen the senseless attack on our own cell structures and tissues – autoimmune disease. ​LDA is used to treat all types of allergy, sensitivity and intolerance to inhalants (pollens, dust, mites, danders, etc. ), foods and chemicals. It is used to treat such conditions as seasonal and perennial hay fever, asthma, all types of food allergy and many other medical conditions. A variant of LDA known as Low Dose Immunotherapy (LDI) can be used to treat a variety of autoimmune conditions. Low Dose Antigen (LDA) immunotherapy uses very low dose antigens enhanced by a minute dose of the enzyme, beta- glucuronidase. Beta-glucuronidase stimulates the production a type of T-suppressor cell known as a T-Reg (regulatory), which can “switch off” helper cells that are erroneously causing patients to be ill by misidentifying normal substances in the body to be invading micro-organism. The lifespan of T-cells in the bloodstream is approximately 7 weeks, so LDA needs to be administered only every 8 weeks at first and then less often as time passes. The injections are given with ultra-fine 31 gauge intradermal needles on the inner aspect of the forearm. LDA immunotherapy is most effective when appropriate patient guidelines are followed before and after the injections. It is important to be aware of the various “rules” of LDA therapy and to follow these to the best of your ability. LDA and the related LDI are an extremely low dose immunotherapy that uses broad-based mixtures of allergens (antigens) and microbial extracts made immunologically active by the enzyme beta-glucuronidase. Enzyme Potentiated Desensitization was developed by Dr. Popper, an EENT physician working in London. He found that “Hyaluronidase” injected into the nasal mucosa of patients with nasal polyps relieved allergy symptoms. Dr. McEwen of London in 1967, expanding the work of Dr. Popper, showed that the enzyme “beta-glucuronidase” derived from hyaluronidase had desensitizing activity. Beta-glucuronidase mixed with a tiny dose of allergen or antigen is theorized to stop allergy reactions by restoring tolerance in the T cells of the immune system. Following the administration of the LDA, there is an activation of the T regulator cells (Tregs). These cells mediate and restrain the inappropriate responses of the CD4 (helper T Cells), CD8 (killer T Cells) and B Cells (antibody producing cells). In chronic immune mediated diseases these cells are mounting responses against what they are programmed to assume are dangers – food proteins, environmental inhalants and even your own tissues. The Tregs then “shut off” the allergic or autoimmune response. Beta-glucuronidase is recognized as a natural biological response modifier and is likely to be a significant physiological up regulator of the lymphocytic immune system. All present evidence leads to the conclusion that LDA restores the natural cellular immune tolerance to specific environmental antigens (allergens), which has become deregulated in allergy and autoimmune disease. LDA uses immune modulation at a concentrations lower than that which occurs in nature. An initial study of over 10,000 patients done in the US from 1993-2001 found no significant adverse reactions to LDA. In a United States study, repeated ear infections in children responded to LDA better than any other condition (we find that ear infections are most often caused by a reaction to foods). A number of double-blinded studies have proven the effectiveness and safety of the LDA treatment. The doses of microbial extracts (LDI) range from parts per trillion to homeopathic dilution; they are too low to cause life-threatening reactions. The effect of LDA is often immediate; however, the full benefit of LDA will take longer. Patients with many food allergies or intolerances will notice sustained improvement after 3-6 doses. The period of improvement should lengthen over time and gradually you should feel quite well for the entire period between injections. Once this occurs, you can begin to stretch the time interval between LDA injections. This will occur in adult patients between 6-8 injections (about a year). Children should be able to stretch their injection intervals sooner. LDA cannot be considered to be fully effective until 6-8 treatments have been given. Please do not begin LDA unless you can commit to at least 6-8 treatments at a minimum. This occurs 3-4 weeks after a treatment (once the lymphocytes mature) and lasts from 2-4 months initially, then much longer later on in treatment. This response begins usually between the 6th-8th treatments, when there may be no apparent immediate response to the shot, but as the lymphocytes mature, the positive effects are noticed. If this is your response, please be patient and follow the guidelines given to you until your shot activates at about 3-4 weeks. LDA is administered by one or more tiny intradermal injections, usually on the inner aspect of the forearm, though it may be given on the legs or abdomen. Sublingual treatment may be an option for additional antigen therapy (LDI). Initial doses are at 8 week intervals for the first six to eight treatments. Subsequently the treatment intervals generally increase. Milk and Wheat usually take the longest time to desensitize completely. When the response is well established, generally between the sixth to eighth dose (fewer in children), the frequency of treatment for most illnesses may often be extended to every three months, then every four months and so on. Half of the patients with multiple problems can stop LDA completely after 8-18 doses. The other half can at least go for long intervals (1-4 years) between treatments after that time. Children usually respond more quickly and may stop sooner. Treatment doses are mixtures of over three hundred allergens that act quite universally. This means that patients who are allergic or intolerant to most substances, and with quite diverse medical conditions, can respond to treatment. Included are hundreds of foods, mixed pollens, cat, dog, horse and other animals (including lab animals), insect, kapok & fiber mixes, dust & mites, mixed molds, fungi, yeast (including Candida), food additives & colors, mixed chemicals, lotions, gasoline, petrochemicals, mixed environmental chemicals, perfumes & formaldehyde. Does not include pesticides or herbicides.